Designed by Guy Légère in a collaboration with Christoph Hartmann of the Berlin Philharmonic, these reeds will last for months with proper care, providing a beautiful tone with no pre-moistening required. This is the green ringed 'Medium-Soft' strength model. 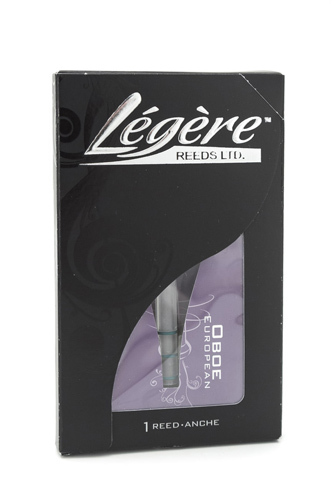 Like their single reeds, Légère oboe reeds have all the depth and warmth that elite players demand. Because they are made from a specially prepared synthetic material, they deliver all the advantages of a traditional Légère reed; consistency, durability and an instant response. Légère oboe reeds are cut from their own unique polymer on 3-axis, computer controlled precision cutting machines. They measure the reeds with extreme precision using computer controlled equipment, and this allows them to maintain very tight quality control. The reeds are cut in halves using their own customized profiles which are based on a mathematical description of a reed profile rather than a model or prototype. The halves are then bonded together again using a digitally controlled system. The result is a reed which is perfectly balanced in both blades, and has just the right combination of tip thickness, heart, and flexibility.